Ever dreamed of becoming a writer? Ever wanted to chuck it all in and become a writer? Former teacher Graham Minett tells us about following his dream to become a published author at the age of 65. “Writing was something I’d wanted to do all my life, but other important considerations – relationships, raising a family, work, sport – got in the way. Then, in 2006, I decided to do a two-year part-time MA in Creative Writing at The University of Chichester. “It was an expensive decision. I also had no guarantees that even gaining the MA would enable me to find an agent and a publisher for my work because, good as the course is, the number who make the breakthrough remains a relatively small percentage. I felt from very early on, however, that it was just what I needed. “Being a mature student was an issue only for me. No one else was bothered by it – in fact, there were a few people on the course who were either the same age as I was, or not much younger, although most were in their twenties or thirties. I’d say it took me a few weeks to adjust and feel totally at home but there was never any suggestion from anyone that my age was necessarily a factor. “After the course, I won a national competition for opening chapters of a novel with a piece I’d created as part of my MA for one of the assessed modules. 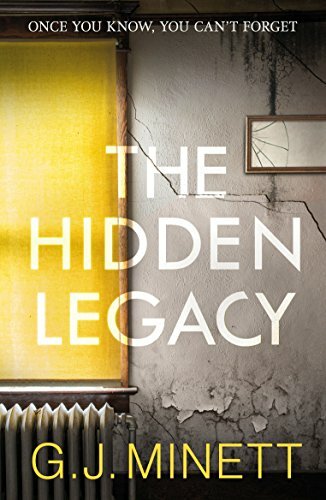 The first prize, apart from a cash award, was a chance to work online with an editor in London to finish the novel – which is what would eventually become my debut novel, The Hidden Legacy. “I found myself with an opening chapter that was clearly very effective, but I had no idea what the rest of the storyline might be. I also had a strong female lead character in mind but the opening chapter was very much 1960s, whereas Ellen belonged quite clearly to the first decade of this century. The first task, therefore, was to come up with two storylines and a complex plot that would bring them both together. To do this I used a board, Post-its, postcards and drawing pins and mapped the whole thing out before I wrote another word. I knew not only exactly how many scenes there would be but also what each scene would do to move the action forward and also what it would reveal of Ellen’s character. “When it was finished to the editor’s satisfaction, I sent the completed novel to an agent, along with a letter detailing the fact that I had done the MA and also won a national competition with the same opening chapter I was now sending to him. He phoned me as soon as he’d finished reading it and asked me to go to Oxford to discuss it with him. He had a contract there waiting for me, and I signed it before I left. “He then recommended it to Mark Smith, head of UK fiction at Bonnier in Marylebone, who gave me a two-book deal, which has now been extended to two further books. 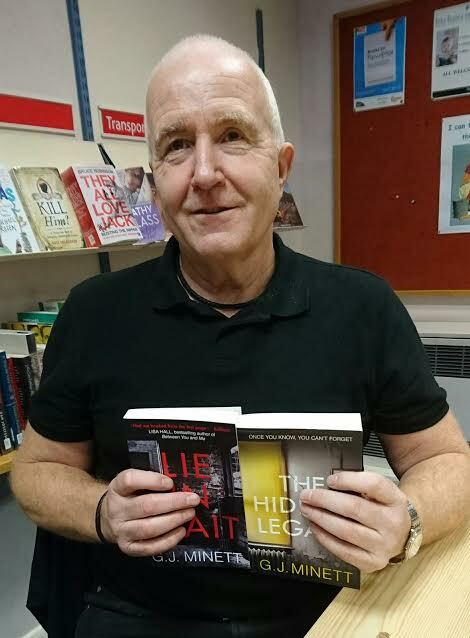 The first two, The Hidden Legacy and Lie In Wait, have both been published in eBook and paperback format and sold far better than was expected from a debut author, both reaching a high Amazon ranking and earning ‘book of the month’ deals. “The whole experience has been every bit as exciting as you might imagine. I still have to pinch myself at times when I see my books in airports and railway stations and in bookshops in town. I haven’t yet seen someone on a beach or on a train reading a copy of it but I’m looking forward to that moment when it comes. “I’ve recently completed book three, which has the working title of The One That Got Away, and will be published as an eBook in November 2017, and in paperback in March 2018. That leaves me planning for book four. I have no idea as yet what that will be about, but my storylines always start with a character. I always try to write the kind of novels I enjoy reading; something that treats the readers with a bit of intelligence, allowing them to work things through without spelling everything out and providing a central mystery that has layers that need to be peeled away. • Don’t let age be a barrier in any way. Most people are happy to judge you on what you do. More often than not ageism is in your own head rather than everyone else’s. • Don’t allow the ‘older you’ to make you too cautious. Obviously use what you’ve learnt over the years but try to stay in touch with the 25-year-old ‘you’ who wasn’t afraid to take a risk or two. • Whatever you move on to, make use of the massive network you’ve built up over the years. Social media is one thing I always swore I’d never go near but my publishers were right to insist that I get onto Twitter and Facebook and use both of them, not just to build up new contacts but also to help me get in touch with people I’d not heard from in 50 years. Whatever it is you want to do, the more support you have, the easier it becomes.